Watervliet is a beautiful semi-detached holiday home from the 1930s with a waterside location in the village of Reeuwijk. A beautifully finished holiday home with unique features like the bay windows, the stained glass and the overhanging eave. Watervliet has its own pier and a motorboat, which should be returned to the owner with a full tank. 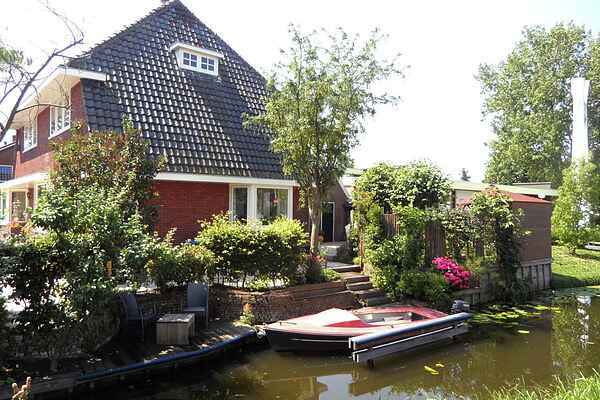 You'll have a wonderful, sunny garden with several terraces and access to an open waterway to the Reeuwijkse Plassen. The boat comes with a sailing permit that allows you to take it into the Reeuwijkse Plassen, which consist of 11 lakes. Having spent the day out on the lake, enjoy a good glass of wine at one of the beautiful pavement cafés or on the covered terrace with patio heaters. The immediate surroundings are great for cycling and walking routes past gorgeous conservation areas. Pay a visit to the historic city of Gouda with its weigh house and many pavement cafés and restaurants, easily accessible both by car and by public transport.